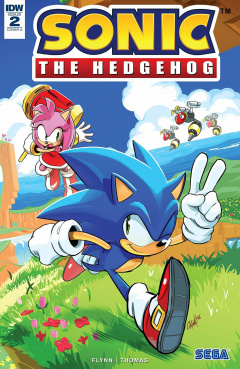 Sonic the Hedgehog #2 is the second issue in the Sonic the Hedgehog comic series published by IDW Publishing. This issue begins with Sonic chasing a Super Badnik to a small town. The hedgehog proceeds to destroy the badnik with a well-timed Spindash, however, once he is finished, the badnik begins to get up again. Thankfully, Amy bashes it one last time with her Piko Piko Hammer via sneak attack. Amy found Sonic specifically to try to get him to rejoin The Resistance. Sonic swiftly declines, explaining to her that Tails said something about the way the badniks are attacking the various towns. They seemed to be more organized than that of Dr. Eggman, who has not had anything to do with the current badnik army. So Sonic decided to go his separate ways to look for clues. In the middle of their conversation, word has quickly spread that the Super Badnik Sonic just destroyed was a fake, attempting to distract them from a large wave of badniks. Sonic and Amy briefly team up to bash some badniks before taking out a cargo ship full of the robots. Amy asks one more time for Sonic to join The Resistance again, but again, he refuses. Amy decides it's probably for the best, and lets him go, but not before offering some directions to where Knuckles may be.